At ClickTime, we’ve always put our faith in the reliability of good data over biased opinion. It’s the value we promote in our products, our management style, and most importantly, in food and beverage. Several years ago we organized SOMA’s first unofficial falafel-off (winner: Sunrise Deli) followed by the most comprehensive blind coffee tasting ever to be held on the 200 block of 2nd Street (Philz Tesora Blend trounced six other coffees). That tasting changed how we brew our office coffee to this day. Now we turn our attention to bourbon — the king of American liquor and the most popular booze you’ll find around our office these days. At a recent tasting event, we considered these questions: What’s the best mid-priced bourbon whiskey? How personal is bourbon preference, or are there brands that can be regarded as generally superior? Does price matter? Can you reliably taste hard alcohol and get back to coding an hour later? So, we assembled a table of six bourbons ranging from $20 to $70 — and 13 volunteer tasters. Each taster was given a sheet to list tasting notes. Tasters could go back to re-taste any selection as much as they liked. Each taster was asked to simply rank-order the six bourbons at the end (1 = best, 6 = worst). Unscientific process at virtually every stage. 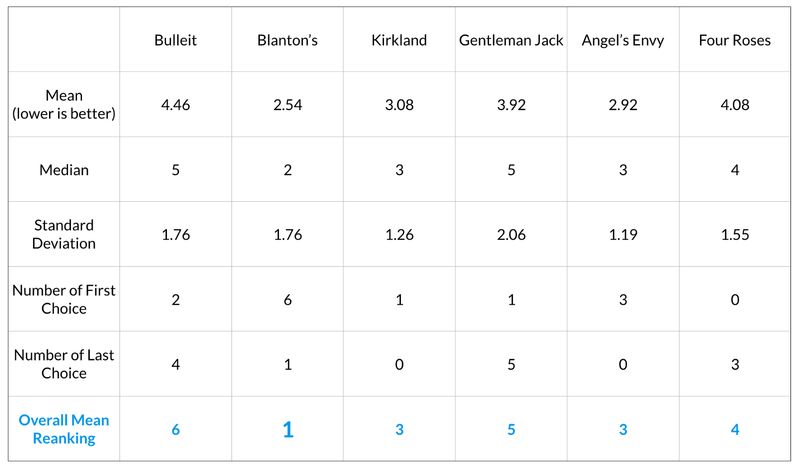 Not all of these whiskeys were the same alcohol content (mostly, but not all, 80 proof). We’re a fairly random assortment of unsophisticated drinkers, some of whom claim to dislike straight bourbon altogether. Only 13 participants, so our results aren’t statistically rigorous. We were pretty buzzed by the time we were done. The handwritten results may have been illegible. Blanton’s ($70). The most expensive of the bunch. It had the decisively highest average score and amazingly, six of thirteen tasters ranked it #1! (A few last-place votes though.) This stuff is downright tasty. It’s is the one you squirrel away for yourself and the friends you really like. Angels Envy ($50). Second most-expensive. Second best average score with the most consistent scores (i.e., lowest standard deviation of rankings). No last-place votes. Stock this in your liquor cabinet to impress your guests. Kirkland 7-year Small Batch ($20). One of the cheapest, but a better-than-average showing and consistent scoring across all tasters. No last-place votes. Great for your mixed cocktails — just hide the label. Bulleit Bourbon ($25). Poorest overall score and 70% of tasters ranked it dead last or second-to-last. A surprising result, since this is a very popular whiskey, especially around the office. Bulleit Bourbon is a triumph of modern branding. People bring significant bias to certain categories of merchandise, and certainly wine & spirits are high on that list. Advertising, attractive bottles, merchandising at retailers, celebrity endorsers — the entire system is designed to influence how you enjoy your drink. When we strip away bias, we get closer to the real truth of what’s working for people and what isn’t. If you are an entrepreneur, then you are also a purchaser. You buy software, office space, computers, storage, insurance, and more. The entire time, you are under assault from brands and marketers, savvy or otherwise, who vie for your time and attention. They cannot be ignored. It is nearly impossible. But you can step back and remind yourself that what you consider a gut decision might in fact not be instinct but rather opinion highly influenced by external signals. So get feedback from your team, listen to your customers, and seek unbiased opinions wherever you can. 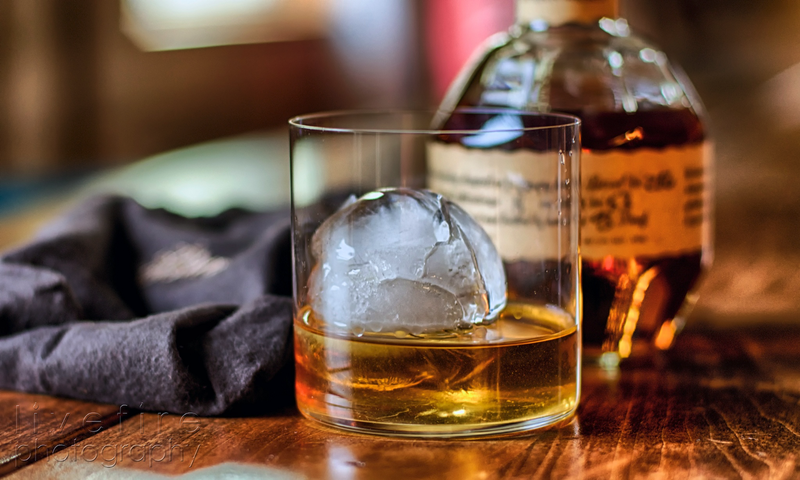 You will make better decisions — and you’ll be more comfortable with those decisions afterwards (as you sip a nice glass of Blanton’s).